Brianna Brooks and Carissa Clearwater's first meeting with the MSBDC Central Regional Office at Clark University was in August 2017. 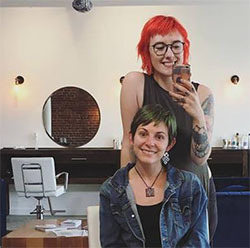 As they had originally been stylists and had never run a business, they needed help in breaking down revenue, cost of goods sold, and operating expenses. After several revisions and adding a third year of projections, the financial model was completed. Brie and Carissa also needed assistance with the written business plan. The clients submitted the model to the North Central Mass Development Corporation (NCMDC) for funding. They received funding and along with their own equity, the funds were used primarily for leasehold improvement for their location in the trendy canal district. With exposed brick walls and plush blue couches, the salon has a cozy yet industrial feel. PageBoy is a collective of craft hairdressers who tailor personalized styles that emphasize your unique qualities. The grand opening was in June 2018 and 120 people attended. As Brie and Carissa are both very socially conscious, these millennials also raised $1,000 for Abbey’s House women’s shelter. Both Brie and Carissa have attended MSBDC seminars to help them with marketing. They continue to utilize FaceBook to keep their clients updated on new hairstyle trends for all ages.